Posted on February 14, 2017 by Richard Loader	in Animals of the Parish. Martin Bennett lives in our Parish and is a keen ornithologist as well as a highly accomplished wildlife photographer. He writes about creatures found locally, we are privileged to have them here. Ravens as well as Pheasants in the New Forest who appear to have a liking for eating snakes. On five occasions I have seen buzzards carrying snakes in their talons, four of them being adders. Identification of the male adder, they have a slim, greyish white/cream coloured body and the zig zag markings down its back which is strikingly dark, and the tail is longer than the females tail. The female, as a fully grown adult is noticeably larger, longer in length, with a bulkier body and a shorter tail,(approximately 10% of the body length) zig zag markings are more dark brown than black, body is more of a sandy colour hence not so pronounced as the male. Both the male and female Adders have strikingly copper coloured eyes, elliptical pupils with a vertical orientation. Occasionally you get black adders (melanistic), which usually are females. Melanistic adders tend to be larger than a stereotypical adder. The reason appears to be they can absorb more solar radiation,allowing them to obtain body heat quicker, giving them an advantage to hunt for food on cooler days. The melanistic adder generally produce more young than a normal female adder. Adders are not sexually mature until they are three to five years old. The female would normally breed only every second year, producing anything from three to twelve young, average being approximately eight. The young are on average 15cm long at birth, born normally in September. Adders slough (shed) their skins twice a year as they grow larger, first slough occurs shortly after they emerge from their hibernacula after being in hibernation for five months (October-March), males emerging from late February/ early March, and females a few weeks later, and then the second slough is shed later in the summer. The adder is our only venomous snake, and has quite a varied diet, consisting of voles, mice, shrews, nestling birds, lizards and frogs. They eat the equivalent of 9 small rodents a year. They will normally bite their prey, wait for the poison to paralyse or kill its quarry, then follow the scent trail to its prey, and consume. In the last 140 years only 14 people have knowingly died from an adder bite, and the last person to die in this country was in 1975, whereas several people die every year from insect bites. 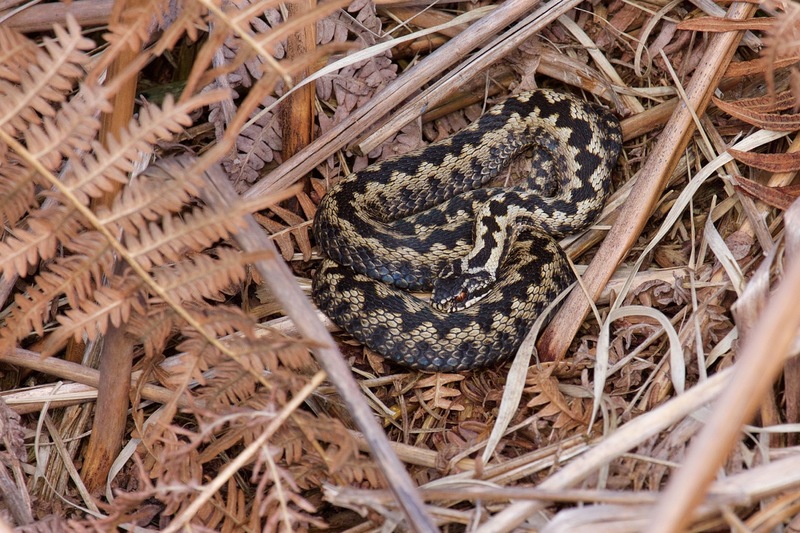 Adders, along with most of the heathland reptile species emerge from hibernation in the month of March, unfortunately February and March is when the heather and gorse burning will be carried out. To burn areas of heathland without a proper flora and fauna study being performed is very poor practise in this day and age, especially when the burn is conducted at a time when reptiles are at their most vulnerable, being in a semi-comatose state having just emerged from hibernation. The Adder has never been under so much pressure than it is today, heathland management practices have to be reassessed. It is imperative that a thorough wildlife survey is conducted at least a year prior to the burn. 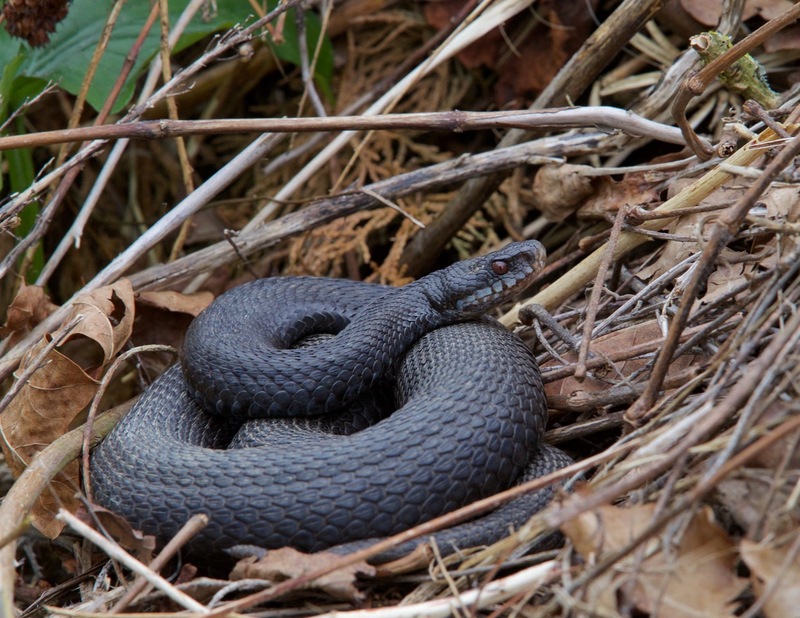 Adders are protected under UK law.